Having recently been named the #1 beach in Australia, it’s no surprise that Manly Beach is surrounded by some of Sydney’s finest bars and cafes. One such establishment, located just footsteps away from the sand, is Girdlers. 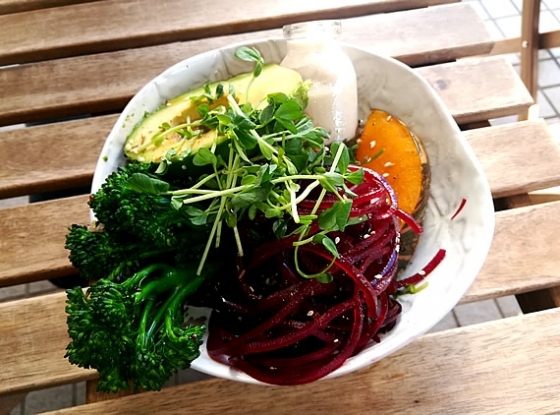 Founded by current Footy Show favourite and former NRL legend Ryan Girdler, the cafe promotes itself as a foodie haven for all-natural, delicious food with no trace of preservatives, additives or refined sugars. The recently-opened cafe in Manly is the third following the successful Dee Why & Warringah Mall locations. We recently ventured out to Girdlers for a healthy meal to kickstart the day. The venue has a welcoming relaxed vibe with friendly staff and beautifully designed boho interiors. Equally as beautiful are some of the guilt free, wholesome foods available on the menu including Porridge, Granola, Eggs Your Way, Coco Chia Jar, Health Bowls, Buckwheat & Sweet Crêpes, Toast, and there’s even a Bacon & Egg Roll “Gone Healthy”. We liked the sound of the Holy Avo and were more than happy to dig into it. 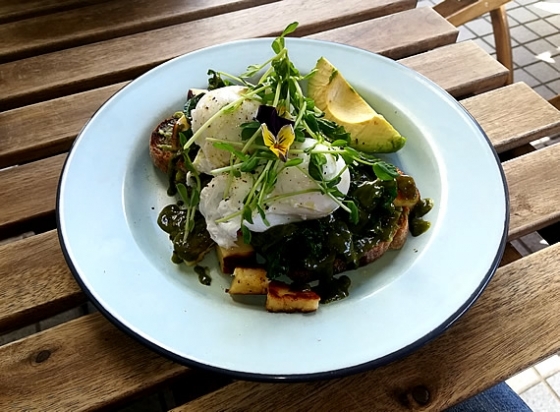 Comprising of avocado, kale florets, grilled haloumi, fresh micro herbs, poached eggs, home-made green goddess sauce on rye sourdough, it was indeed a heavenly meal. The tasty avocado perfectly complemented the grilled haloumi resulting in a highly satisfying, delicious breakfast. Continuing with the health conscious theme, we thought we’d also sample the Vegan Bowl. With maple roasted pumpkin, quinoa tabbouleh, blanched broccolini, dukkah sprinkled avocado, beetroot zoodles and Girdlers lemon tahini dressing, it was fresh and full of flavour. The venue really push their “Simple, Honest, Goodness” concept and this was a prime example of a meal packed with the nutrients your body needs but without the guilt. If you head into the venue a little later, there are also lunch-time options including the Goodness Bowl, Seb’s Burger, Health Conscious Stir Fry, and Mexican Tacos – the latter of which we managed to sink our teeth into. 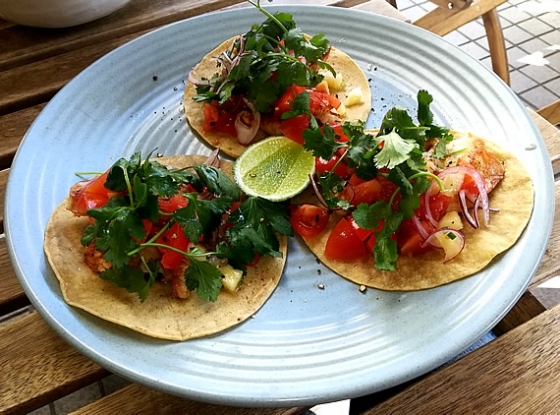 With grilled free range chicken, fresh pineapple, and heirloom tomatoes topped with coriander, lime and chilli dressing on soft home-made corn tortillas, these were possibly the freshest, cleanest tacos we’ve ever had the pleasure of demolishing. And they still managed to be absolutely delicious without being greasy. Girdlers has cemented its position in the community for food and well-being enthusiasts alike. With their wholesome, nourishing and fulfilling dishes along with their own blend of quality coffee to enjoy, it’s well worth a visit when you’re next in the northern beaches. Open 7am to 4pm daily.